This week the Kitchen Ambush Team visited the local restaurant The Landing. Located in Virginia Beach, Virginia, The Landing Restaurant focuses on fresh seafood and local produce. 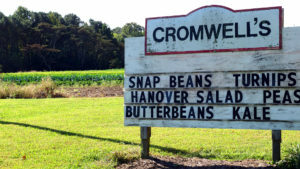 In fact, roughly 90% of all their produce comes from Cromwell's Produce (a local staple and a family favorite of the Hampton Roads area.....and the Kitchen Ambush Team). Chef Erik Jensen has been part of The Landing for several months and is excited to be working with a mentor and friend. And what an impact this young chef is making. Chef Erik's passion for great locally focused food is beautifully presented in all his creations. 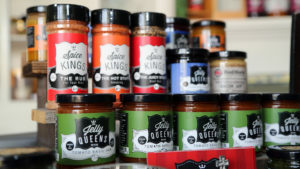 This week, The KA team ambushed The Landing and Chef Erik with a secret ingredient from our dear TEXAS friends at The Jelly Queens and The Spice Kings. And what could be bigger than an ingredient from Texas....well the heart and personality of the owner of this wonderful local Texas business. Her heart is just as big as her bold flavors! INCREDIBLE! From sweet to savory, from apps, to entrees, to desserts, her products can be incorporated into just about anything. This week, we gave Chef Erik the Rosemary Tequila Grapefruit Marmalade which he turned into a chimichurri glaze for the most succulent porterhouse pork chop EVER! Paired with a creamy and tender quinoa, the fried rice inspired side featured beautiful heirloom tomatoes and ripe avocado folded in for a rich buttery finish. Let's just say that EVERYONE in the restaurant attacked the plate with equal parts ferocity and child like joy. Our visit to The Landing with Chef Erik Jensen was most definitely a successful Ambush. A must visit Virginia Beach restaurant for sure! But don't forget that The Landing is also part of an incredible collaboration called the VB Supper Club. Four of the areas best local restaurants, stock full of incredibly talented Chefs, create a multi-course food experience not to be missed. The food and evening are second to none and tickets sell out quickly for each event. But for Chef Erik, the family atmosphere of the kitchen is what got him involved. A group of like minded passionate people come together as colleagues to cook, but leave as family, filling each event with laughter and magic. The attendees are the real winners in these special events! Make sure to tune in next week to see who we ambush next! 1 local restaurant, 1 local chef, 1 fantastic dish. And remember....It's Better When It's Unexpected!